The Florida Frontier Guards; Seminole War Re-enactors & Living History, 1835-1842. Notes regarding the dress of militia and volunteer soldiers of the Second Seminole War, 1835-1842. 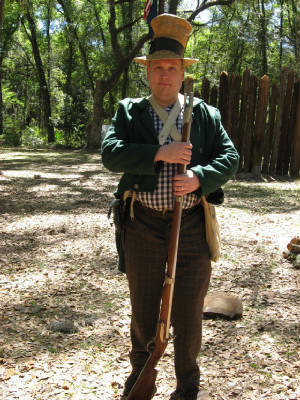 Private Greg Chappell of the FFG as a typical militiaman/volunteer of the 2nd Seminole War era. The Dress of the "Florida Frontier Guard' s" Soldiers is the common dress of American of American men during the period 1835-1840. Cloth Forage cap. (from pattern in the "Workwoman's Guide" 1838). A man's Round Jacket. (citizen's coat, frock coat, hunting frock, or military coat or jacket is acceptable). Man's pantaloons (tight) or trousers (loose). broad-fall and small-fall preferred. Man's leather shoes (period correct). Black cotton cravat or colored Neckerchief. White or other color period square-cut shirt. Period ankle length cotton or flannel drawers (optional). In the present day, the idea of American soldiers without uniforms seems odd. Regardless, that is exactly the condition of state volunteer troops in United States service in the period 1815-1861. Instead, the soldiers were each paid clothing money by the US government for providing their own clothes. Only the soldiers of the small regular army were legally allowed government issue clothing. The volunteer and militia troops who served in the "Florida War" generally did not wear uniforms of any kind. 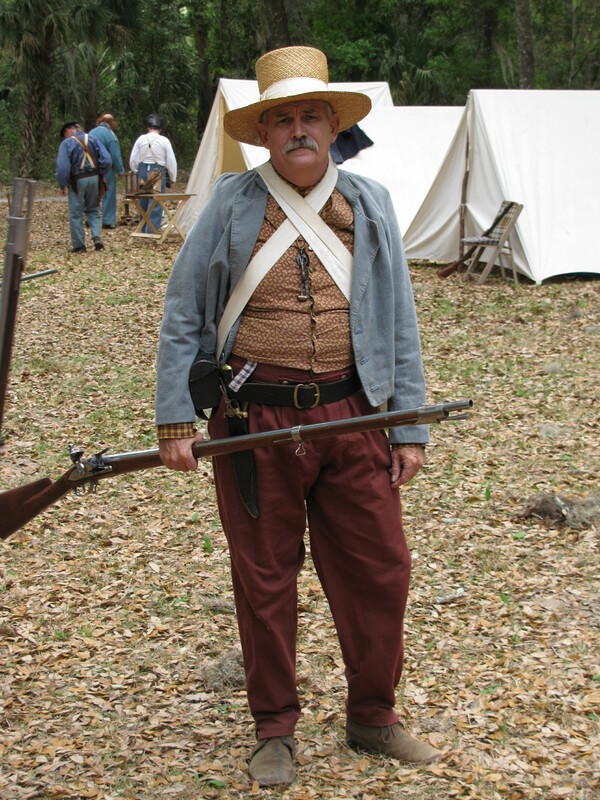 Regardless, some, particularly at the company level, had some sort of "uniform" clothing, but most were dressed as described by Lt. W.W. Smith of the South Carolina Volunteers, in "hunter's dress, homespun, or common clothes" into Florida service. These included "strong" garments of fustian (sturdy cotton goods, like corduroy or velveteen, often dyed a "leaden or olive" color), and occasionally common citizen's coats "which had seen enough service [at home] to recomend them for a campaign." 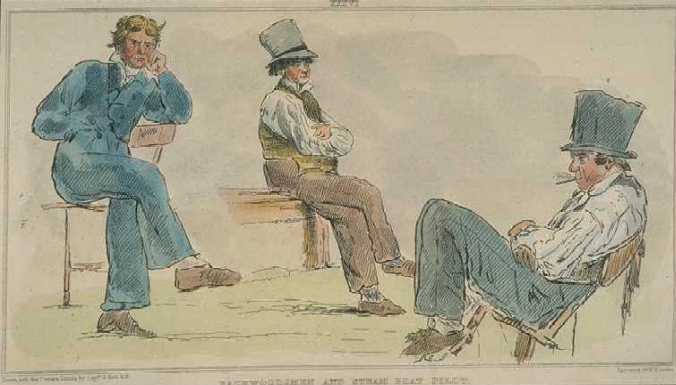 A description of the South Carolina officers of 1836 noted many wore leggings, and some even "caoutchouc" or india rubber treated coats "of dingy hue and buckram starchness" which were popular in the period. Men commonly wore hats in society, but in the 1830s caps were popular for gentlemen while travelling. W.W. Smith says among the troops in Florida in the winter of 1835-1836 "nearly all wore the mocknuter, or foraging cap," made from the fur of muskrats, rabbit, or fox. Several contemporary images of such caps may be found in the 1830s paintings of William Sydney Mount, and others. The Florida Territorial militia also appears to have foregone the use of uniforms for active service. Achille Murat describes Florida militia wearing homespun cotton clothing, and woven palmetto hats (they were popular in hot weather in the period...). Surgeon's Steward John Bemrose of the 2nd Artillery noted that the Florida Mounted Volunteers of 1835-1836 wore plain "planter's dress" with the swords of the officers alone distinguishing them from their men. "Planters' dress" in the period was the wear of a linen (or cotton) round jacket in lieu of a coat, and a broad brimmed hat. M. Myer Cohen noted in 1836 that the militia of St. Augustine paraded with cockades affixed to their hats. In 1839 a battalion of Florida troops was described as armed with rifles, wearing broad brimmed hats and "short jackets." Some Contemporary Descriptions of Militia/Volunteer troops. Of the various companies of this regiment, only two wore anything approaching a "uniform." The Irish Volunteers ( a uniformed volunteer militia company from Charleston) wore uniforms of "similar stuff" as Elmore's Riflemen, but of "darker hue... in close bodied short coats, lined with their favorite green, a broad stripe of which ran along the outer seam of their trowsers." Except for that company, the volunteers were "scarcely distinguished by any difference in their attire; all wore plain dresses and such as were best adapted to the woods and swamps." The documentary evidence suggests that the overwhelming number of militia and volunteer units of the 2nd Seminole War were armed with United States muskets or rifles, and corresponding accouterments. During the 1820s-1830s the bulk of the arms produced by the US Government were distributed to the various states based on the returns of the strength of their militias. These arms were then either stored by the state or distributed to the militia units or individuals. The larger part of these arms were made by the various government contractors, in "contract brown" finish on the barrels, etc. The militia of the Territory of Florida was in an un-organized condition when the 2nd Seminole War broke out in 1835. Consequently, General Richard Kieth Call (later Territorial governor etc.) purchased a large number of shotguns to equip the Florida mounted volunteers who subsequently engaged in the first campaign of the war in late 1835. The South Carolina militia companies which travelled to St. Augustine to assist in the defense of that place in early 1836 did so equipped with state arms and equipments. The majority of the "militia" units of the war served in Florida as US volunteer troops, and were consequently equipped with weapons and accouterments from the various US arsenals. General Winfield Scott drew arms etc. from several of these arsenals in early 1836 to equip the US volunteers, including those at Augusta, GA and Mount Vernon, AL, etc. General Gaines drew arms from the arsenal at Baton Rouge, LA to equip Col. Persifor Smith's Louisiana Regiment during the same period. The larger portion of these stockpiled US arms were likely War of 1812 and earlier vintage. This accounts for the widespread find of old pattern US Army 1808 brass oval bayonet scabbard belt plates in Florida.The arsenals drawn on for arms for the Florida War were subsequently restocked with new made arms and accouterments while the old patterns were exhausted and worn out in Florida by "volunteers and [US service] Indians." When the volunteers were mustered out of service, they left their arms and accouterments in Florida, where they were stockpiled in ordnance depots at Tampa Bay and Garey's Ferry ready for issue to new incoming volunteer units. John Mitchell in typical 1830s laborer's dress, perfect for a campaign in Florida. 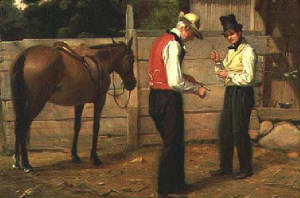 This 1830s painting shows the typical undress of working men. South Carolina Mounted Men of Col. Goodwyn's Regiment at the Withlacoochee River, 1836. 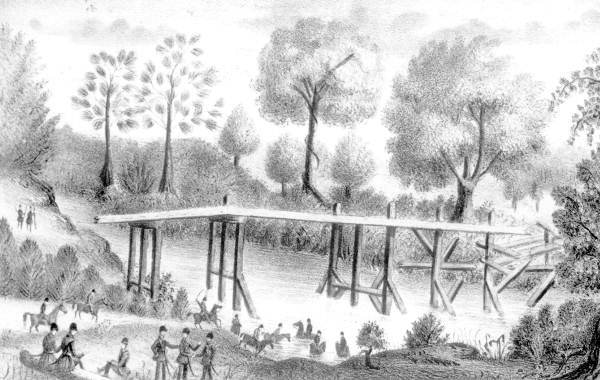 1828 view of southern backwoodsmen, and a steam boat pilot, by Basil Hall.